Feel queasy (but surprisingly hungry) after the doctor's visit - I popped to a nearby hawker centre and was delighted to find that Chicken Macaroni Soup was being sold. I envisaged a delicious bowl with lots of chicken goodness in it - just like how mum used to do it for us when we were kids. 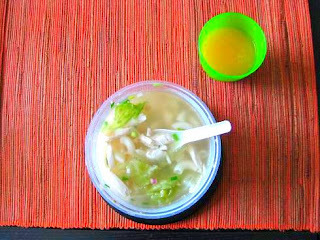 Unfortunately, although I asked to "upsize" it from S$2.50 to S$3, it turned out to be a measly bowl - with a few shredded pieces of chicken, and weirdly, overcooked iceberg lettuce. It definitely wasn't enough, especially since I was also downing Vit C and orange juice - acidic drinks that made me hungry. Alas I had nothing much else to eat in the kitchen! (We have not done our weekly grocery shopping) Besides cheese and ice-cream (which I would usually snack on, but the doc said no dairy), I only had instant noodles and chicken nuggets...oh and some eggs. So I added on to my lunch, 2 chicken nuggets, and a bowl of instant noodles with an egg. aiyoh. u poor thing. hope you got some rest today. hopefully you get well soon. lately, the weather has been really annoying. and p/s: a woman have more than one organ!!! indeed. chicken macaroni at these stalls are usually disappointing. doesn't stop me from trying them tho i must admit. i love chicken macaroni soup! imp: Am better! The Doc's meds for sore throat worked wonders. But since I'm back to work, I can't take the ones for body aches and stuffy nose lest I fall asleep at my desk! eleh: Yeah, it is either rain or super hot sun! Haha, yes indeed. beanbean: I know! So terribly disappointing. I was eating it thinking how much better I could have cooked it myself! It is actually not difficult to do, not sure why it can't be done better at these stalls.